I’m a bit confounded by Rush Bros. I mean, yes, it’s got platforms and you hop about until things happen and levels end, but in the meantime this rush of neon color mixed with indiscernible shapes and pulsing house music leaves me bewildered like a deer stuck in the headlights then getting shot up with tranquilizers. The premise is as follows; you are inexplicably a DJ who has been forced into some sort of platforming arena, and must prove your DJ skills by racing against the clock or another DJ of a different DJ race, avoiding traps and overcoming obstacles and speeding to the finish line. This is in fact standard operating procedure for the hiring of all DJ’s for wedding receptions, since parkour skills make sure the “Chicken Dance” comes out right through the speakers. Rush Bros’ presentation screams music, speed and power. 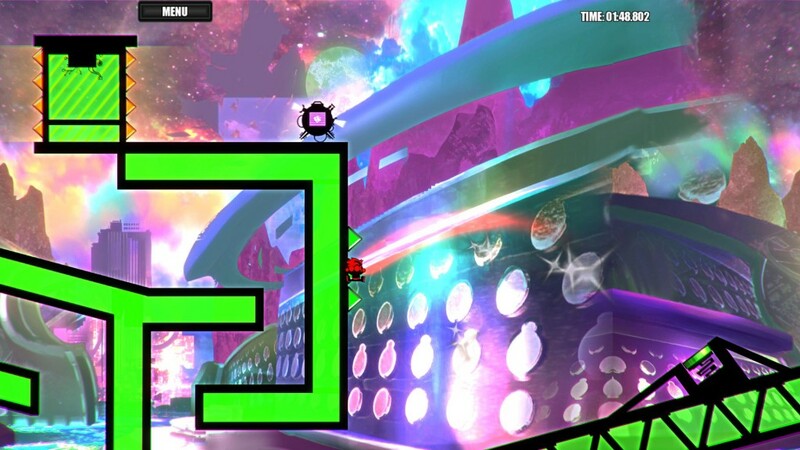 The levels are composed of heavy neon encased in a wrapping of loud music, which can be swapped out in the menu for any music on your computer. 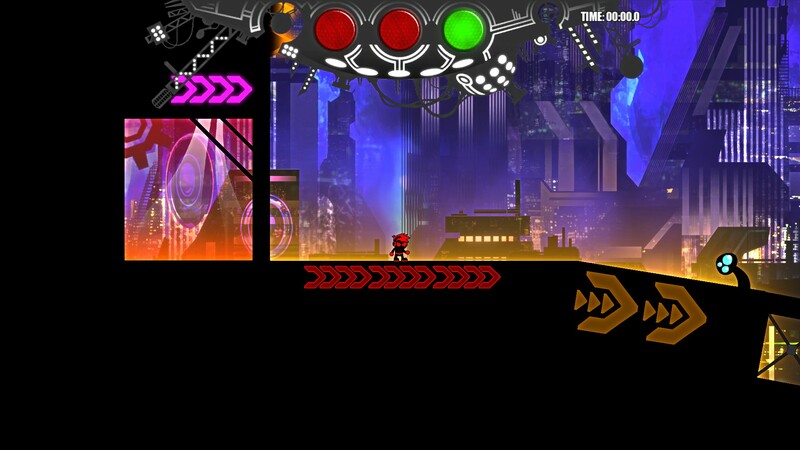 A clock in the top right corner and universal leaderboards, as well as local and Steam multiplayer indicates that you should be racing through levels and beating out the competition. Why then, does Rush Bros feel like a muddy bag of mixed messages? The musical theming is the first aspect that threw me for a loop. Yes, you have in game music controls. Yes, you can conveniently replace the music with your own library in the main menu. Yes, you are in fact playing as a DJ. But none of it is relevant to play. There’s no issue necessarily with the theme of a game not hooking into the gameplay, but music features so prominently in every screen and button of Rush Bros that I was left scratching my head as to the purpose. Level design has some weird monkey wrenches popping out hither and thither as well. While some adhere to the tried and true “go right, you idiot” convention of platforming, others have insane round-about, maze-like aspects, with keys and doors and springs and such obstacle course paraphernalia. While this works at times, many of the stages feel loose and unsatisfying to play through. Several have massive tracts of empty space, dead ends and jumps that just feel awkward. It doesn’t help that a lot of the game is incredibly hard to read. 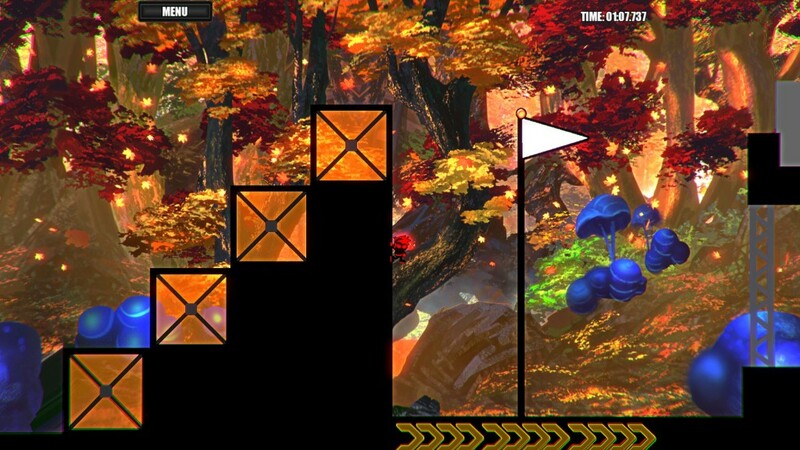 Dangerous blocks share the color palette of the level, which makes judging each one’s ability to harm you difficult. Springs will often bounce you in directions they aren’t facing, making them feel arbitrary and obtuse. Sometimes there’s graphic elements, most commonly what appears to be a sound wave coming out of speakers in the background, that have unintuitive effects on your character. For instance, one causes you to bounce away from its epicenter, whereas another, slightly different looking sound wave allows you to double jump while in its vicinity. I have no idea how you’re supposed to figure that out except by accident. Mechanically Rush Bros also falls short. You run at a single speed without any sprint. Instead, you can dash repeatedly to gain speed and increase your jump length. This has some interesting applications but feels quite a bit wonkier than just being able to run faster, which is a tried and true staple of platforming. Jumping works fine, though there’s not much sense of weight as you’re maneuvering through the air, which is slightly disjaring, and the jump height is fairly low, making some of the jumps feel disjointed. But where Rush Bros really fails is the wall clinging mechanics. I consistently found myself accidentally clinging to walls like my body was made of glue, only to accidentally hop off too early onto ANOTHER wall and cling to that one forever. Narrow corridors are especially frustrating to get out of, as even trying to fall straight down them often results on accidentally sticking to them half a dozen times. A lot of these seemingly unfathomable design choices do, however, come together a bit when you finally find an opponent to race against. The designs of the level, the way powerups are scattered about, the slightly subdued nature of your run and the need to dash for speed, all just make more sense when you have an opponent in game. But that doesn’t change the wonky wall hanging, and some levels still feel awkwardly designed. Rush Bros starts feeling rough when the conflict between its theme and its mechanics becomes apparent, but it gets really bad when you realize that even ignoring the inconsistent presentation, the jarring level design and basic movement mechanics simply aren’t very fun. You never have the sense of flowing speed like a Dustforce would, nor the adrenaline pumping precision jumping of a Super Meat Boy, or really any defined sense of the game. There’s a number of individual details that turn out okay, individual strokes that are interesting. But there’s no “whole,” no complete package that comes together for any length of time. Rush Bros is available at your local Steam vendor.